Still Lifes with Biblical Message. Vanitas painting by Willem Kalf. 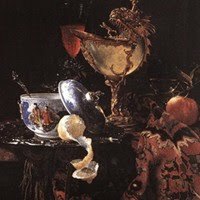 Definition: What is Vanitas Still Life Painting? In fine art, the term "still-life painting" (derived from the Dutch word "Stilleven") refers to a general type of painting, typically consisting of an arrangement of inanimate objects laid out on a surface. Traditionally, still life artists painted flowers, fruit, game, storage vessels, or kitchen utensils, but today almost any object, or collection of objects, may be included in a still life picture. 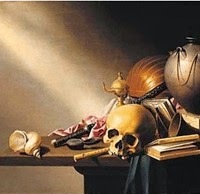 The term "vanitas" describes a specific type of still life picture. We may define vanitas as being: "a still life painting of symbolic objects that conveys a biblical or christian message about the transience of earthly life when compared to the permanence of Christian values". This form of Christian art was refined by Dutch Realist artists during the Dutch Golden Age of the early 17th century, as a reaction to Roman Catholicism and Catholic Counter-Reformation Art, and to meet the new austere aesthetics of Protestant Reformation Art in Northern Europe. Vanitas paintings, which flourished during the period 1620-1650, became especially popular with well-to-do devoutly Protestant citizens in Holland, following the country's revolt against the colonial rule of Catholic Spain. 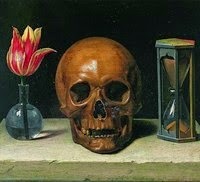 To see how Biblical art like vanitas painting fits into the evolution of European painting, see: History of Art Timeline. The word "vanitas" is Latin for "vanity". A vanitas painting tries to convey the essential meaninglessness of earthly goods and pursuits, when compared with the eternal nature of true Christian values. It is associated with a verse from the Bible - "Vanity of vanities, everything is vanity" (Ecclesiastes 1:2;12:8). A vanitas picture contains collections of objects symbolic of the transitory nature of life, the vanity of wealth and the inevitability of death. Viewers are asked to reconsider their misguided coveting of worldly pleasures and possessions, to remember their mortality, and to repent for their sins. Vanitas still lifes - the only religious art approved of in Holland - appealed to wealthy Protestants for their realism and moralistic message, but also (one suspects) because they helped to ease their conscience for having acquired so much worldly wealth. Typical motifs used in 17th century vanitas paintings included a number of standard elements, symbolizing: (1) Wealth and power - like gold, jewellery, coins, purses; (2) Earthly pleasures - such as luxury fabrics, pipes, wine glasses, dice, playing cards; (3) Secular knowledge - like books, inkpots and pens, maps, telescopes; (4) Inevitability of death/ passage of time (associated with the Memento mori theme) - skull, hourglass, chronometer, watch, burning candle, butterflies, flowers, fruit. Sometimes the featured objects would be jumbled up in disarray, signifying the inherent weakness or futility of the achievements they symbolize. A peeled lemon shows that things may look attractive but still have a bitter taste. Nothing could express the egotism and transitory quality of life better than the 'skull'. In searching for contact with the viewer of the painting with its deep dark eye sockets, it signifies not only its own evanescence, but also that of all of mankind and all human pursuits. The futility of trying to do without God is the constant characteristic theme of vanitas painting. The flowers will wilt, the fruit will rot, and even the worthless game and the purse full of money cannot deceive us as to the inevitability of our eventual demise. (The Sic transit gloria mundi theme, that worldly things are fleeting".) Even the accomplishments of science and literature have no lasting existence, neither does music. Ironically, vanitas paintings were themselves examples of valuable worldly goods and, as such, became 'Vanitas' objects themselves. Vanitas still lifes first appeared in Nothern Europe during the late 1520s, and gradually gained in popularity. For example, the German artist Hans Holbein (1497-1543) completed a series of portraits which included still life imagery, complete with Vanitas-style symbols. See, for instance: Portrait of Erasmus (1523), Lady with a Squirrel and a Starling (152728); The Merchant Georg Gisze of Danzig (1532) and The Ambassadors (1533). In a sense, the covert religious content of these Vanitas works fulfilled the spiritual need left untended by the decision of the Protestant Church not to commission any large religious works. The centre of vanitas painting was the Dutch town of Leiden, an important site of Calvinist theology, with its focus on man's sinful nature and its stern moral code. As it was, certain towns had a preference for certain vanitas symbols. Thus art collectors in Leiden - a university town - favoured books and skulls, while those in the Hague - a market centre - preferred fish with its traditional Christian meanings, while Amsterdam favoured flowers. The vanitas genre declined from about 1650 onwards, although still lifes continue to be popular with collectors to this day, and count a number of major modern artists among their greatest exponents: including Van Gogh, Paul Cezanne, Emil Nolde, Giorgio Morandi and the photorealist Audrey Flack, to name but a few. During the golden era of Dutch Baroque art a number of artistic movements sprang up in towns like Haarlem, Delft, Leiden, Utrecht, Dordrecht and Amsterdam. The greatest vanitas painters from these schools include the following: from Leiden, David Bailly (1584-1657) - often wrongly credited with the invention of the genre; from Delft, his nephew Harmen van Steenwyck (1612-56); from Utrecht, Jan Davidsz de Heem (1606-83); from Amsterdam, Willem Kalf (1622-93); from Haarlem, Willem Claesz Heda (1594-1681) and Pieter Claesz (1597-1660); and from Dordrecht, Samuel van Hoogstraten (1627-78). In addition, one might even include Jan Vermeer (1632-75) as a vanitas painter, as many of his single-figure genre paintings are as moralistically symbolic as any work by Steenwyck et al. In France still life and vanitas painting was dominated by Jean Chardin (1699-1779), while in Spain the greatest vanitas artist was Francisco de Zurbaran (1598-1664). - An Allegory of the Vanities of Human Life (1640) National Gallery, London. - Vanitas (1640) Stedelijk Museum Amsterdam. - Still Life w. Skull, Books, Flute and Whistle (1646) Kunstmuseum Basel. - Still Life w. Earthen Jar, Fish and Fruit (1652) Rijksmuseum, Amsterdam. - Still Life w. Fish, Peaches, Bucket, Berries & Cucumber (1652) Rijksmuseum. - Still-Life with a Nautilus Cup (1662) Museo Thyssen-Bornemisza, Madrid. - Still-Life with Lobster and Nautilus Cup (1634), Staatsgalerie, Stuttgart. - Flower Still-life with Crucifix and Skull (1630s) Alte Pinakothek, Munich. - Vanitas Still-Life with Musical Instruments (1660s) Rijksmuseum, Amsterdam. - Still-Life with a Peeled Lemon (1650s) Louvre, Paris.  For more about Dutch Protestant still lifes, see: Homepage.